What does it take to continue to grow as a leader in the concrete and masonry restoration industry? With just shy of 100 years of experience in this industry, Western Construction Group continuously searches for innovative products and equipment in order to provide the craftsmanship we are known for to customers, and continue to remain competitive in today’s market. 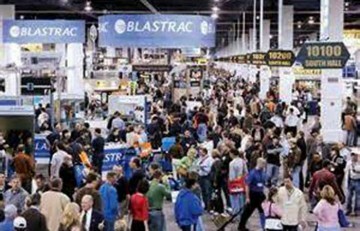 Each year, members of Western attend the annual World of Concrete event in Las Vegas, NV. The World of Concrete showcases suppliers, products, safety products, equipment, construction software, as well as offering industry related training courses for both concrete and masonry construction. As a member of Western, one of the key focuses this year was to look for products that would help increase productivity and still support Western’s first class safety program. This year RNP unveiled a new product to the industry that caught my attention, and fell right into the wheelhouse of what I was searching for. They introduced the PAM DEK, an ergonomic accessory tool that assists workers while performing chipping work on concrete decks. Traditional chipping can be strenuous on a workers hands, arms, shoulders, and backs, as the worker is performing work in an unnatural position. The PAM DEK is designed to take the strain off of the worker by neutralizing the weight of the chipping hammer, reducing vibration, and allowing the operator to maintain better posture while performing work. By providing these benefits to the worker, products like this will not only reduce injuries, but can increase productivity as the employee will not get as fatigued using this equipment, compared to traditional methods. We are constantly striving to provide a safer and more productive work environment for our Team.